Your dog is more than just a pet, they are a member of your family. Providing your furry family member with a safe and nice place to sleep and relax is a crucial task. With so many dog houses on the market, finding the right one can seem like an irritating chore. From fun shapes and colors to fancy features, selecting the best home for Fido can be trying. We had our pet testing team check out the cream of the crop in pet houses. Relax and take a look at our reviews and read through our buyer’s guide. Before you can say, “fetch” you’ll have found the house of your pooch’s doggy dreams. Who Needs a Dog House? The Petmate Indigo Dog house is crafted from heavy-duty structural foam. It is shaped like an igloo. The material and design are more than purely aesthetic, and they will keep your fuzzy buddy warmer in cooler months and cool in the hot ones. The house has microban to help keep germs at bay to protect your pet and family. The Petmate Indigo was created with windy areas in mind to protect your pet. The house also features a design that allows snow or rain to slough off while warmth is reflected down towards your dog to keep them feeling nice and toasty. Our pet testing team loved how easy the Indigo is to assemble without needing any tools at all. The Arf Frame Dog House by Pet Squeak looks just like a rustic A-frame cabin. Your pup can relax in style without worrying about the weather. 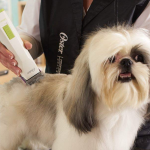 With four different size options, you are sure to find a perfect model for your pooch. The Arf Frame Dog House won big points from our testers thanks to its availability in four different sizes. 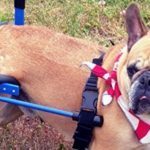 The extra small fits pets up to 15 pounds, small fits up to 30 pounds, medium for dogs up to 50 pounds, and large for animals up to 80 lbs. You can also select between a natural wood look or a pretty pink cottage for princess pooches. It was also very quick and simple to assemble which made both our testers and their pets happy. The Our Pets Tuff-N-Rugged Dog House offers a solution to housing larger breeds. This house can comfortably accommodate a 125-pound dog. It is easy to keep clean thanks to its plastic construction. This offering from Our Pets features a double wall construction, for insulation. 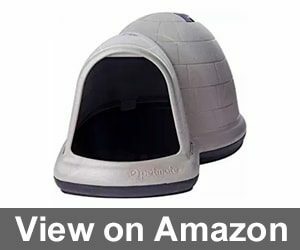 This will allow your pup to be cool in the summer and toasty in the winter. The house was also incredibly fast to assemble a has UV resistant colors to keep it looking brand new for years to come. 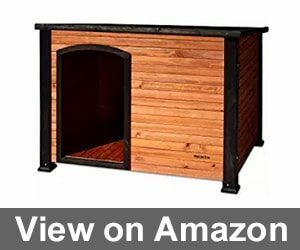 The Boomer & George Large Dog House Lodge is a gorgeous option for smaller breeds. At 67 inches by 31 inches by 38 inches, it will comfortably fit smaller to medium sized pooches. This home features an off the ground design to protect your dog from snow or rain. The Boomer & George Dog Lodge looks like a Swiss ski chalet and includes a sweet little porch so your pal can relax. One of our pet parents mentioned that she wished it came large enough for her to live inside. Our testing team also loved the solid wood construction and raised floor. 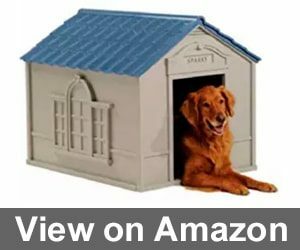 The Petsfit Dog House is available in several different sizes to accommodate a wide variety of sizes and breeds. An off-center doorway allows your pet more space inside for lounging and stretching. This house was very fast and easy to put together, which our pet testing team loved. The Petsfit Dog House features a roof that is attached to one side and lifts up with hinges that lock it into an open position. 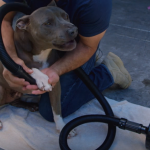 This feature makes cleaning and checking on your pet a much easier chore. The home of lifted off the ground which will extend the life of the home while keeping your dog comfy and happy. 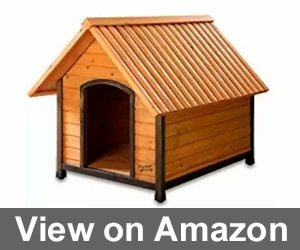 The Precision Pet Extreme Log Cabin is offered in three sizes to accommodate dogs up to 90 pounds. A slanted, weather resistant roof crafted from wood and asphalt keeps pups dry and happy on rainy days. The house is made of solid wood that has been sealed with a coating to resist damage from wet weather. The Precision Pet Extreme Log Cabin features an off the ground floor to prevent damage during rainy or snowy days. Pets stayed pretty dry in this option during rain according to our testing team. For especially wet climates, you may need to retreat the wood eventually to prolong the life of the house. The Doggy Den Dog House is as adorable as it is functional. Designed to look like a sweet, little cottage, your pampered pet will love lounging in their new home. This option features a door that can be closed or propped open with a hook that’s attached to the frame. The Doggy Den Dog House is crafted from white cedar. It smells absolutely amazing and has the added benefit of keeping your furry child free from fleas, moths, or other pesky nuisances. It is also straightforward to put together, so your precious pup will be lounging happily in no time. 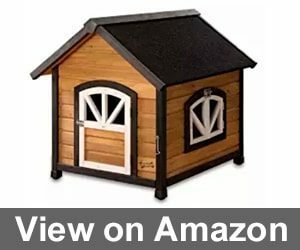 The Suncast DH350 Dog House is perfect for larger breeds. It comfortably houses pets up to 100 pounds. Crafted from double resin and a crowned floor, the house is lightweight and easily moved. This offering from Suncast arrives with vinyl letters so you can personalize your pet’s new home with their name. A removable vinyl door panel will keep your pup happy in rainy weather. Best of all, the house snaps together quickly and without any extra tools. 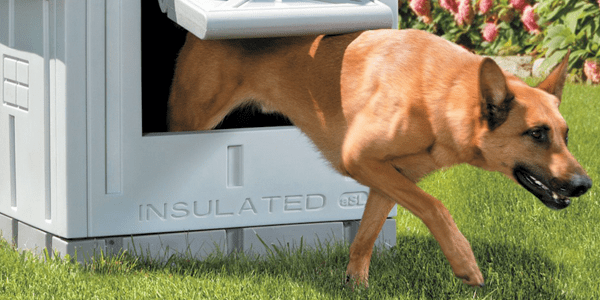 The Suncast DH250 is a basic, no frills option that will comfortably house dogs that weigh up to 70 pounds. Crafted from double resin, this house also includes a crowned floor. The roof is removable to make cleaning up messes quick and simple. The Suncast DH250 snaps together quickly. It is lightweight and has vent holes to maximize airflow. While this option does not include any added frills, it is a lovely, basic choice at an extremely reasonable price. The Merry Products Wood Pet Home is perfectly suited to smaller doggy pals. It is crafted from kiln dried cedar to assist in protecting your fur baby from fleas and other unsavory pests. With a raised panel floor, your pet will be sitting pretty regardless of the weather. 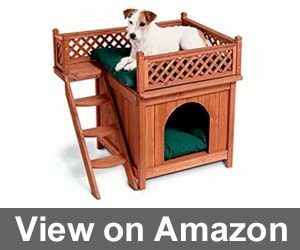 The Merry Products Wood Pet home features a fun design that includes lattice woodwork and a balcony. The home also has a built-in step ladder to allow your pet an easy climb to the second-floor balcony. This home took around 20 minutes to assemble and was well loved by our puppy testers. Looking for a new dog house but are unsure of what your key considerations are? Look no further. We have created this handy guide to assist you in understanding the big choices you’ll need to make when shopping for a new home for your pet. Although dogs have become domesticated and feel comfortable living in our homes, many still have a primal need for their own special spot. This is the reason that you’ll often find your pup curled up under a desk or napping inside your laundry basket. Dogs like to find a space that is cozy enough to capture their body heat, but that is large enough they can easily stand up and turn around. Having their own designated dog house can help your pet feel happier and more secure. Just like with most important purchases, the material your new dog house is crafted from is a key consideration. Each composition has both great and not so great qualities, so let’s take a closer look. Dog houses have been made from wood for well over a hundred years. Wood offers unlimited design add-on options. A house made of wood will protect your pup from rain and sun. It is also better at insulation compared to other options, so your pet will stay warmer in winter and cooler in summer. Wood is often cheaper than other materials. It also looks more natural. On the downside, bugs like ticks or fleas may also want to move in and take over a wooden dog house. This issue can be avoided by selecting wood such as cedar that will discourage pests to take up residence. Plastic dog houses are lighter than those made of other materials, so they may be easier to move or cost less to ship. You won’t need to stress over your animal friend getting splinters or worry about purchasing and applying stain or varnish to protect the house from the elements. A plastic puppy house is also quick to clean and lacks the porous material that insects love to make their own home in. On the negative end of the spectrum, plastic houses may not be as pretty to look at. Most do not offer any insulation unless they are double walled, which can result in Fifi being too hot or too cold. It’s also nearly impossible to repair the home if its damaged. A metal dog house is sometimes also referred to as a crate. They are often made of stainless steel or aluminum. These houses are popular to potty training as well as giving your dog a place to sleep. Since they are not usually enclosed, they are meant for indoor use and will not protect your pet from rain or heat for example. Selecting a dog house that is sized correctly for your furry friend is another huge consideration. You wouldn’t try to fit your Great Dane in a chihuahua sized condo, so understand your specific pet’s breed and sizing will help you immensely. We found a plethora of dog house sizing formulas and diagrams, but wanted to break it down into an easier method. Your pet’s new home should be large enough for them to stand up fully and turn in a 360-degree circle. They should also be able to lie down and stretch out comfortably. The interior height of the house should be 1.20 times your dog’s height. The length and width should be 1.25 times the length of your pet from nose to rump (or tail). Canines feel safe and secure in smaller, more cozy spaces. For this reasoning, you don’t need to follow the adage that bigger is better. A too big house can be a turn off for pet and can be harder to keep warm in winter or cool in summer. Know your breed. If your dog is just a puppy, they are still growing. Do some research to see the average weight and height of their breed to pick a house they grow into. You can always make a cardboard mockup of the dog house you have your eye on. Coax your pup inside to see if they can stretch out and turn around comfortably. The doorway to your pup’s new place must be large enough for them to enter and exit easily. You want to make sure it isn’t too large, however. If the door is too big, warm air will escape in the colder months or rain could get in, making the house uncomfortable to sleep in. Keep in mind that dogs can duck easily when entering the home, so the doorway doesn’t have to be their same height. The doorway’s height should be no less than your dog’s shoulder height multiplied by .75. The opening of the doorway should be at least one inch larger than the distance between their shoulder and the bottom of the chest. The width needs to be slightly bigger than the width of your pet so measure them at their widest point and multiply by 1.25. These measurements will allow your pup to get in and out comfortably while keeping the inside as cozy as can be. Another door option involves using a door of sorts to protect your animal friend from wind, rain, snow, or nosy neighbors. This type of door is simply a piece of vinyl with slits in it to allow your pet the ability to enter and exit as needed. Another nice attribute of this type of door covering is that your pup can still see outside. The roof needs to protect your dog from weather, the sun’s harmful UV rays, as well as giving the home a shape and some style. Wooden dog houses usually are offered in a traditional pitched roof where two sides meet in the middle to form a peak, just like Snoopy’s home. Some versions incorporate a single panel roof, often with a gently sloping edge from the front of the house to the rear. Some dog houses even include a skylight so your pet can watch the clouds float by. The roof will likely need a protective element or covering. The most typically used materials include asphalt shingles, wooden shingles, metal, or tar paper. Some roofs are crafted to allow you to lift them off of the house to allow for easier cleaning and maintenance. The floor of your new dog house needs to be raised a couple of inches up off the ground. This attribute will keep your pup safe from moisture, provides protection from fleas or other insects, and will help to further insulate the home. That will keep pets warmer when the temps are lower and cool on lazy summer days. While wooden house are usually the most popular type of puppy home to purchase, there are some drawbacks to wood floors. They may start to degrade or rot especially in wetter, more humid climates. This can be alleviated by putting the house on top of bricks, stones, or wooden blocks. Older pets may benefit from the placement of skid plates or bathtub non-skid decals on any potentially slick flooring to prevent falls or injuries. You will find suggestions for everything from newspaper shreddings to old towels to straw for use as bedding in your pet’s new home. The unfortunate downside of these materials lies in the fact that they can harbor unsightly critters such as fleas, ticks, or germs. One option os to use cedar shavings since they will repell any pests. A moisture proof foam pad can also be a terrific choice since fleas can’t penetrate it and it will stay dry. Some fancier dog houses have porches or awnings that let your pup relax in extra shade while still enjoying the sights and sounds of nature. Just make sure it is at least partially covered to protect your dog from UV rays or inclement weather conditions. It is imperative that your new pet abode supplies adequate ventilation. A lack of well-ventilated air can result in a stifling hothouse that could be potentially disastrous. Pets, just like humans, need to breathe fresh air. Dogs are in danger of heatstroke as a result of they furry coats and inability to sweat. Winter months also pose a threat as excessive moisture could condense in the interior house areas resulting in a clammy and uncomfortable environment. These conditions are prime real estate for germs, bugs, and mildew. Ensuring that your fuzzy friend’s home is properly ventilated will keep the risks of these problems at a minimum. The doorway allows for ventilation to the house. However, if you utilize a door flap, it could cause the flow of air to be reduced. Make sure any flaps or doors have slits or holes to promote air circulation for maximum comfort and health. You could also drill a few small holes near the roof to allow for adequate ventilation. If you live in a colder climate, you may want to purchase a home or add in a system for heating. Some short hair breeds or smaller pups may have a harder time staying warm in colder months. Heating options include a stand-alone heating unit, metal light bulb heaters, or a heated mat or bed. Just be sure to follow all manufacturer directions to avoid injuries. While there are thousands of doggy house options available, finding the best one for your pet is simple when you keep their needs, size, and preferences in mind. We hope you enjoyed our dog house review and handy buying guide. Please leave us a quick note below with your favorite dog house models and any questions you have about finding the best home for your beloved pet. I had both a cat and a dog, and with the cat, everything is quite simple – you just buy a beautiful and comfortable litter box and the house is ready. But the situation with dogs is completely different, you choose a real home for them, in which they will sleep and miss for you. So hard to make a decision! We have some troubles with money now so we had to buy a cheap dog house. I understand that comfort is the most important thing, that’s why my dog lives in The Suncast DH250 now. As I can see, he enjoys it. It’s very convenient for cleaning because of the roof but when we’ll have more money we will buy something wooden. I have the same situation but has a stereotype that cheap things are worse than expensive. But if you say this house is good, I’ll try to order it too. When I ordered a dog house for the first time, they sent me the wrong size, so we needed to change it. Then, when I got the right size delivered I saw that it doesn’t suit our dog at all because he didn’t like. And now I’m searching for a new house, hope I’ll find it. It is said that The Doggy Den Dog House is easy to assemble, and it’s true! I spend a couple of hours to set it. It’s very cute and my dog is happy to have it I suppose. It suits my pitbull well. To adjust it to our weather conditions I added a plastic flat door and now I don’t want to buy anything else. 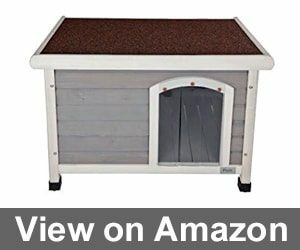 Happy to share my experience with The Precision Pet Extreme Log Cabin. It was delivered two days earlier than I thought, the shipping is great. 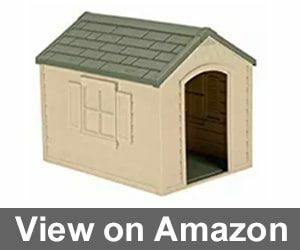 This dog house is very easy to build and I liked that there are three size variants, I have chosen the second one. My dog likes it and that’s the most important thing, I suppose. So a good quality for its money! I’m not so happy with the delivery, maybe we used different delivery services, but the product satisfies me every time the dog enters this house. Like it so much! The dog house which I have was presented me by my parents, they bought it for their dog and it didn’t suit her. So this house which I didn’t choose at all is still a home for my dog for two years! Can you please share a model or at least a brand with me? I want a durable variant too but can’t find it. The best dog house is the cheapest one or the one which was made with your hands. I like the one which we made for our dog and our lovely pet looks happy living there. I adore The Merry Products Wood Pet Home for materials and comfort it gives to my dog. The stairs turned out to be very important for our dog, it’s like another place for fun so we don’t need to buy some things for entertainment. A great idea! We’ve created a house by ourselves and now our dog is the happiest in the world. We’ve bought The Petsfit Dog House in medium size a few months ago and since that time we haven’t noticed any troubles, our dog liked it at first sight. An option of choosing the size is great because we have a puppy now and in future, we’ll need to change the house to the bigger one. We’re sure it’ll be Petsfit once again. Three days ago I got The Large Dog House Lodge delivered. It turned out that it’s not big at all but, fortunately, it suits my pet. The house looks the same as in the picture, it’s adorable and I recommend it to everyone who needs something bigger than the usual house. We couldn’t find a suitable dog house so decided to make it ourselves. We’ve put our souls into it and I strongly believe the pet feels it. I like how wooden The Boomer & George Large Dog House Lodge looks like. We’ve bought it a few months ago and don’t want to change it to something else. A great way to keep your dog in nice and comfy place. Pay attention to its size while choosing cause it’s only for small dogs. I wanted this house so much, but the size isn’t suitable at all. It’s a pity that there’s no similar option for bigger dogs. I’ve done a dog house by myself cause I didn’t find the suitable variant. Don’t be afraid to spend some hours creating it, your dog will thank you. Doggy Den Dog House is the best really! I’ve presented the same to my mother and her dog is happy too. So just read about it a little bit more and make sure I’m not the only one who thinks it’s the best. My dog refuses to sleep in a dog house, just don’t know what to do. I hope that a home-made one will attract her. Of course, I like hand-made dog houses but if there’s something good on the market, I’d better buy it. So my favorite one is Doggy Den Dog House. It looks good and my dog feels comfy being there. It’s hard for me to choose between the Suncast and Doggy Den variants. There are things that I like in the first variant and the things that I adore in the second one. How to choose? I like the things Suncast makes. 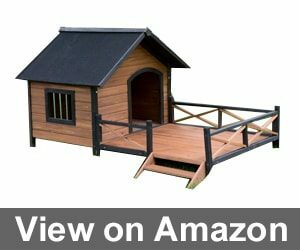 Especially, Suncast DH350 Dog House is the thing I recommend to all dog owners I know. You’ll be satisfied both with quality and price. It’s so hard to find a good option among the cheap dog houses. They all have more cons than pros so I don’t want what to do really. Suncast is my favorite brand, and especially Suncast DH350 Dog House. I like how it looks, how my dog feels inside it, and I hope it’ll be durable. And what can you say about the materials? I want to buy the same house but hesitating whether it is made from non-allergic materials. Are they of high quality or not? I haven’t tried many houses, but this one is made from good materials really. I had no problems with my dog, maybe because he’s not allergic. I think you should read what’s written on the website and check whether there are dangerous materials. Rains aren’t surprising in our state, that’s why I needed something water-resistant. My choice was Precision Pet Extreme Log Cabin and I’m happy about it. 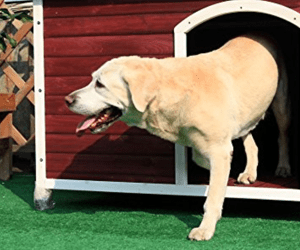 The design, convenience and quality of materials are things why I appreciate this dog house. Oh, great recommendation. I was searching for an option suitable for the wet climate. Thanks so much! If Suncast DH350 Dog House weren’t plastic, it would be the best option on the market. I like the fact that it’s easy to clean it and to transport. We like visiting our parents with our dog and taking this dog house with us isn’t a problem. Recommend this product for those who are limited in money. I have the same dog house and can’t say anything bad about it really! I agree that it’s a great option if you need to transport your dog quite often. Also, I forgot about buying new and new liquids for cleaning as it’s not a problem to get rid of all dirt using the simplest options on the market. When I bought a new dog house I didn’t think that a large doorway will be a problem. Actually, it doesn’t protect my dog from snow and rain. So now I’m trying to find something else. I’ve never thought it may be a problem. 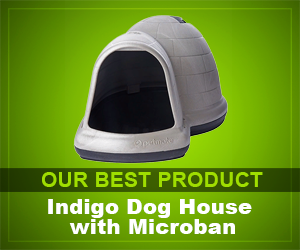 It’s very windy in my region, so to keep my dog safe I bought Indigo Dog House with Microban. I have nothing to complain about and recommend this house to all dog owners. I have two dogs, one is like an elephant, I didn’t think I’d find a suitable dog house. The second one is small, so I didn’t have any problems. Finally, I decided to buy similar dog houses but of different sizes. 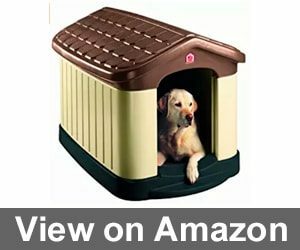 Doggy Den Dog House fits all my demands, so I recommend it for everyone with the same situation.